Below find a pentagon-based carbon nanocone with 35 atoms. Isn't it amazing how a single pentagon causes what would otherwise be a flat hexagonal network to fold up into the shape of a 5-sided umbrella? Play with it a bit to find out what angles between edge-on sheets show up in projection? Do these faceted structures sometimes occur in nature? Possibly. For example, how do the angles seen in edge-on projection above compare to the angles between line segments in this image of strange unlayered-graphene found in soot particles condensed in the atmosphere of red giant stars, long before the formation of the solar system we live in today? Read more about this stuff here. High-resolution electron microscope images with contrast proportional to projected-potential are sensitive to the amount of faceting in carbon nanocones. Faceting might guage the extent to which nanocone walls have retained polygonal cross-sections, as might be expected if formed by a bulk process like the dendritic crystallization of atom-thick sheets. For example droplet-solidification after laser ablation has been implicated in formation of high-purity single-walled nanohorns in laboratories on earth, although carbon nanohorns (e.g. with several apex pentagons) have much smaller cone-angles than pentagonal nanocones. 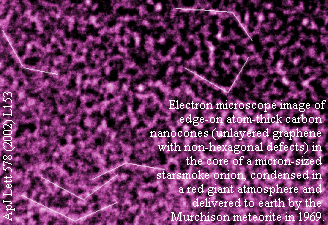 Additional diffraction and hi-res electron studies, with both data acquisition and modeling of unlayered-graphene from the core of micron-sized interstellar graphite onions, are therefore in the works. Here's a larger 5-sided umbrella: This allows you to double-click on each of two atoms to label the distance between them, to double/single/double click on three atoms to label the angle spanned at center atom by the triplet, and to double/single/single/double click on four atoms to label the dihedral angle between the two planes defined thereby.